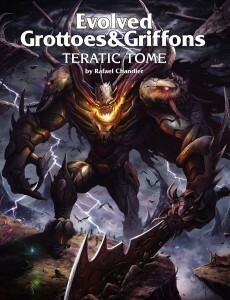 I’m sure it’s no secret to anyone how much I like Teratic Tome by Rafael Chandler. I’ve written a review of it, and I think it will affect how I design monsters in future. Rafael focused primarily on bad things, and a few neutral-but-dangerous ones. I want to explore some of the ‘good guys’. I think first, though, I need to explain what I mean when I talk about making ‘teratic monsters’. There are four key things important to remember when designing teratic monsters: They are inhuman, they have a place in the setting, they are distinct and specific, and they can be identified even in their absence. First and foremost, and absolutely critical: they are inhuman. There is something about them that sets them apart from normal people. Monsters are not just a danger, they are monstrous. Even relatively benign creatures should be pretty alien. It is entirely appropriate to recognize what they are doing, without being able to understand why they are doing it or what they expect to gain by it. I think this is the thing that really makes a monster teratic to me. Identifying what makes a monster inhuman brings out the memorable elements of its description. Nobody will remember that it had eight hit dice, they might remember that it had an unusually high rate of decapitation critical attacks… but they almost certainly will remember that it collected the heads and almost lovingly removed and preserved the faces to make a macabre gallery. Second, there should be some specific story to them. This might be the origin of the creatures (or first discovery), it might be an example of where it was known or believed to have been, but there should be specific anchors within the world. Creatures may be associated with specific events in the setting’s history, or locations, or items, but they must have a place. Nothing is “often found in forests”. A particular creature or group of creatures may be “suspected in the depredations on the villages of in the Cerrtarlan Wood”, but they are not simply “often found in forests”. This is be the element that integrates the creatures most into a setting, and makes it easy to pick up and use in other settings. The inhumanity of the creature makes it memorable, this element gives it a place and makes it clear how it may best be used in a game. Third, often creatures will be unique, or nearly so. Many truly are unique, others are small bands (of unique but related creatures — something like the Norns from Norse mythology, say), yet others might be full tribes. Even if there is an immense tribe of creatures, there should be nothing quite like them anywhere else. To use an example from my Teratic Takeaways post, there could be goblins just about anywhere, but they won’t be Jhesiri. They might be small humanoids with certain characteristics, but there will be things that set them apart from other goblins. Even something as generic as zombies should have things that distinguish them from each other — the Drowned Men of Fen Relan will be different from the Natronic Walkers of the Sandy Waste. Mechanically they might simply be reskinned. The Jhesiri and the Hilljacks might both be small humanoids with exactly the same racial ability score modifiers and traits, and probably considered at least a nuisance by other races, but they should be distinctly different from each other in the setting. The Drowned Men and the Natronic Walkers similarly might be slow-moving undead humanoids with no real power beyond being hard to kill (again), but again they should be distinctly different (Drowned Men tend to smell rather worse, for one, bloated and with flesh half rotted hanging from their bones, while the Natronic Walkers are dried and hardened by the salts of the sands they were interred in). I think this is a valuable element. I believe ubiquity of some creatures is good for establishing consistency within a setting, but when it comes to adventures the player characters should be experiencing new things. That they are mechanically equivalent is a useful quality for the setting and scenario designer, but there should be distinct differences between creatures and groups nonetheless. Fourth, in addition to having evocative descriptions of the creatures themselves, there should often be discernible signs of each type of creature even when not obviously present. This is obviously appropriate when the creatures have been somewhere or acted somewhere, but it can also be appropriate when the creatures will be somewhere or will act somewhere. The presaging signs might be as prosaic as identifying conditions in which the creatures will come (“Jhesiri migrations happen every time there gets to be too many; a rich summer can mean the next spring will see the little bastards swarming us”), or as unnatural as omens that shake the world. The Jhesiri and Hilljacks are both goblins, but they are not the same thing. Jhesiri are filthy scavengers and opportunists, Hilljacks are viciously cunning burglars. They will both prey on villages, but in different terrain and using different tactics. These will leave different signs. Jhesiri usually make their camps where they can and it is convenient, and move on when they become too disgusting even for them (or more likely, easy sources of food and plunder run out, or big enough threats emerge to force them out), while Hilljacks make sound and well-concealed encampments in the forest, nomadically moving about from camp to camp to avoid drawing too much attention at any given time and place. This is an important tool for agency. It provides information that players can use to plan their actions and activities, and gives clues for what happened in a place or who (or what) was involved. It can influence what other characters and groups in-game do: when the full moon is seen at midday and there is frost at Midsummer, the Fey Host rides and all sane mortals take shelter through the night. Notice that all these things have very little to do with mechanics that represent the various monsters and other creatures. I feel it important to mention that this is similar to and reflected in my Entity Template. Many of the same considerations in designing the monsters of Teratic Tome fit well into the Entity Template, which pleases me, but I think it a parallel development. All of them identify descriptive and narrative elements of the creatures and how they fit into the world. There may be a certain philosophical bent (and Rafael’s writing is bent in some fascinating, if sometimes disturbing, ways) to them, but I think the important things to remember is that they are inhuman, that they have a place in the world, that they are unique or close to it, and that it is possible to identify them even in their absence. Hit all four points, and even (mechanically standard) goblins and zombies can be teratic. This was not the post I had intended to write today, but the introduction explaining what I was aiming for in the one I did plan to write today. I suppose I’ll have to come back to the teratic celestials another day. I have some interesting things in mind for the angels, archons, and azata. I was doing something similar with these guys; although I didn’t give much for your fourth point, I feel that their “proxy war” could possibly qualify. I read about a good idea called “bullseye” element design, which is related to your uniqueness point. You take a generic setting element, then have a special kind of it in the local area. Then, within the central feature of that area, make the special ones even more unique. Taking your zombies for example, in the Sandy Wastes you have a special kind, the Natronic Walkers. They’re dried and hardened, and perhaps if they can lay hands on you they can drain the water from your body. Within the Sandy Wastes lies the pyramid of Zool-Ifrak, and inside it are the Natronic Guardians: they lie in wait in the form of a pile of salt, then reassemble themselves and attack. The Natronic Guardians can also jump (pun intended) incredible heights and distances. The bullseye thing sounds like a very good practice. Teratic design doesn’t explicitly follow it, quite, but could be trivially extended to do so — especially as you get rid of the outer rings. If the outermost ring is ‘monster’, you might have within that ‘undead’, then ‘zombie’, ‘Natronic Walker’, ‘Natronic Guardian’, and ultimately ‘Natronic Paragon’. Keep the three outermost rings for your own use, but only ever show the PCs the innermost. It occurs to me that just as you could have multiple circles within ‘monster’ and ‘undead’, you could even have multiple circles within ‘Natronic Walker’ and ‘Natronic Guardian’. The idea of terratic monsters seems very inline with Johnn Fours’ concept of bullseye design when it comes to gaming. In that, you take something global, like goblins, figure out how they are unique in the region, and then figure out how that regional variant is even more unique locally. Ah, that’s where I read it. Thanks for writing this; I found your four points much more useful than the book itself. Pingback: Echelon Reference Series: Barbarians… Goes Live | Keith Davies — In My Campaign - Keith's thoughts on RPG design and play. In the Mountains of Aradan can be found the nightmare creatures known as Red Horrors. Whole tribes of these beings lurk in caves all over the mountain range, waiting to trap and kidnap unwary travellers. They fear the light of the sun, but under cover of night they slither forth in large numbers to raid villages, farms, and mines. Many mining outposts have been wiped out when Red Horrors infested their mineshafts, appearing suddenly to ambush and capture workers for hours of grisly torture. When people living near a lair go missing they leave behind a lot of blood, only some of which is that of the victim. Trails of blood show the passage of a gang of Red Horrors, who rarely travel alone. It looks as if a lump of wet meat was dragged along the ground. In caves which have housed these monsters for extended periods, the fluid-smeared walls may have started to transmute from rock into pulsing flesh. The Horrors often dig out and extend their homes, bloodying the passages as they go. Explorers would do well to watch out for cunning traps hidden amongst the gore. If a victim’s body is ever found, it will have been carefully vivisected and thoroughly gutted. The organs will be missing, but bones and skin are always left behind. Those trained in the surgical arts may note that great care has been taken to keep the victim alive — and probably conscious — throughout the procedure. In appearance, a Red Horror is as a misshapen pile of glistening organs, roughly humanoid in outline but only around two feet tall. Two stolen eyeballs nestle amongst mounds of intestine where a head should be. They are experienced at remaining perfectly still and silent, but are also capable of surprisingly rapid motion for their size. They have fine control over their hideous bodies, and are avid tool-users.